Have you been into an RRCG bus lately? If you have not yet seen the latest changes in the bus they you might be in for a surprise. There is an innovation that this bus transit had been implementing which is revolutionizing the way we will see bus TV. This is SPINMANILA's Bus Transit TV and Sticker Ads, an exclusive programming inside and outside the bus. 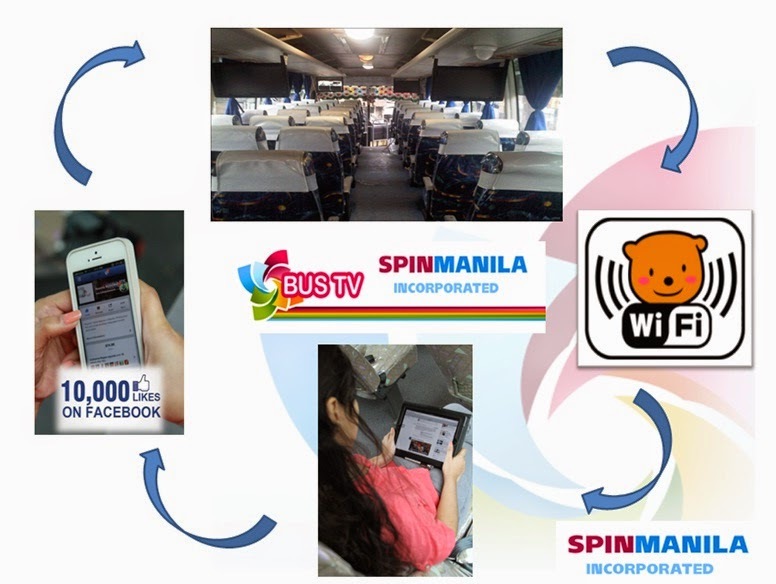 Established in 2009, SPINMANILA Incorporated is an entertainment company with the objective of upgrading on-board passenger entertainment as well as encourage internet usage among their viewers. They are dedicated to the development of BUS TV, conventional and digital media, advertising industry, along with the advancement of positive values for the general public. The companies core business is the delivery of programs across various city, intercity, and provincial bus routes. Also, its vision is to develop BUS TV as a media platform for passenger generated content and to create high levels of viewer involvement, as well as bus ridership as a transport mode of choice. BUS TV enables you to bring your message to a targeted market by allowing you to generate demographic data of passengers through campaigns in Facebook, Twitter, Instagram, and other mainstream social networks. This is possible since your ad is exposed to passengers while they enjoy the use of FREE WIFI on board the bus. BUS TV allows marketers to customize their marketing strategies to a geographic area in order to be more aligned and more cost-effective. Land Developers for example, can feature ads only those proximate to a specific route, making their ad more targeted while maintaining the same cost. BUS TV bus routes ply the arteries of Metro Manila, where the greatest amount of travel demand are served. On conventional TV, viewers tend to jump from one channel to another and choose from dozens of channels. On the other hand, the average time commuting is 30 minutes to one hour and 30 minutes, and passengers will not be able to switch off or change the channel, therefore, increasing the exposure time and maximizing a client’s campaign reach. Through this medium what we see as revolutionizing is the fact that companies and advertisers must definitely Create Ads that are Involving. Contents can be customized and updated every week, aligned with the marketer’s advertising and promotion campaign. You can do teasers which intensify the passenger’s interest per week ,etc. Get the most out of WIFI on board by linking your message to your websites. Around 41% in Metro per month People aboard the Buses every morning and the same in the evening. There is always a recurring reason to travel. Commuters do so to get to work, school, and attend to leisure activities. The bus, being the primary mode of transport in the metro, caters to a recurring market. Thus, when the brands are exposed on the screen at a high frequency throughout the whole day and with an increase in the average time spent commuting, this results in a higher brand recall rate. Digital video advertising becomes an integral part of fully integrated marketing campaigns, delivering the same brand messages directly to target audiences in places with greater relevance to context and time. All this for just a fraction of the advertising budget! It seems that this one is indeed a cost effective advertising and is highly recommended. For more information about HOW YOU CAN ADVERTISE just click on the image below and view their contact details. 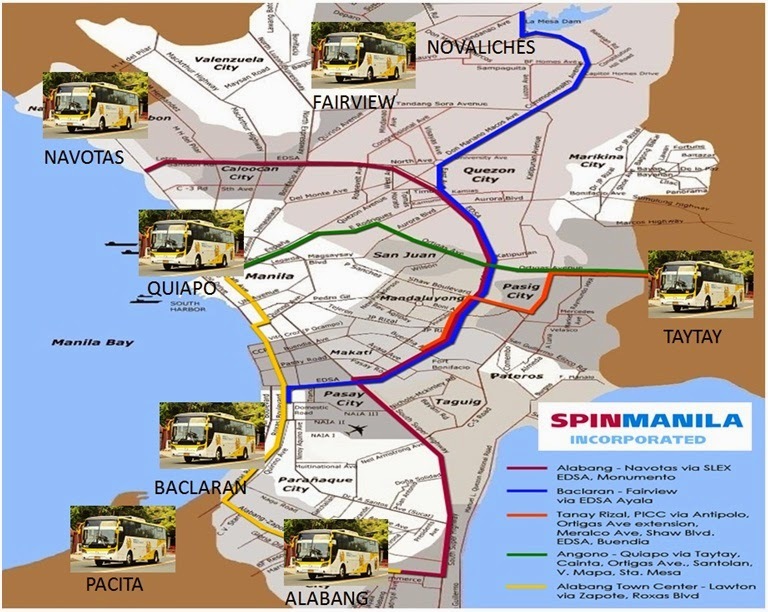 Connect to them on Facebook at www.facebook.com/spinmanilainc.